Episode 30 time and things have come a long way in this season but still show very little progress in the grand scheme. This episode has previewed to be a Red vs Red episode. Those promises have lied in the past so click "read more" and find out if it has happened again. 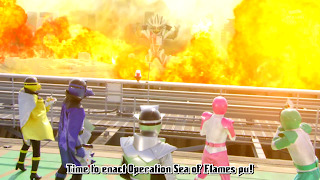 The episode begins at the Patranger's HQ with Keiichiro filling out a form to take a trip the next day. However, when Noël Takao enters the room, everyone tries to hid it and say that Keiichiro is just taking a vacation. You can tell they don't trust him anymore. 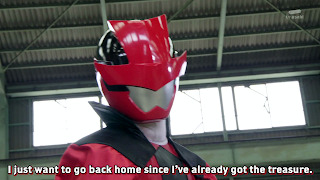 It then cut ahead to when Keiichiro is about to leave where he runs into Kairi who act very excited to see him and insists on going with him. This of course, was planned by Noël Takao to have Kairi spy on him. Cut to intro! These episodes are really in a rush to get to the plot. One theme song later, the main villains tease a new Gangler named Kunks. Gross. Meanwhile, Kairi and Keiichiro behave like two alpha-males and get into mini competitions with each other while on the trip including eating, and shooting games. This series of charming events ends quickly though when Keiichiro finds a lost child. How cliche. A little girl who got lost looking for her missing hair clip. Keiichiro's cop instincts kick in and he drops everything to help her. Kairi attempts to secretly buy a new hair clip but Keiichiro exhausts himself and finds the missing one earning him some praise and frustrating Kairi. 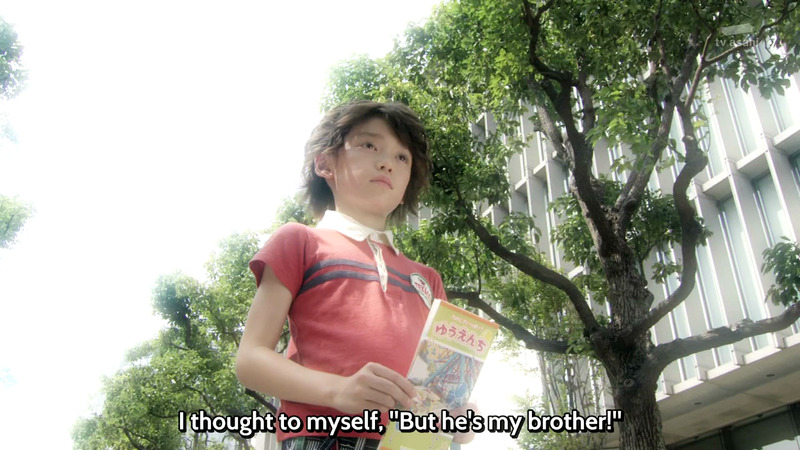 It is hard to say but I feel like this scene held some deeper meaning like it was trying to show how Kairi still cannot understand Keiichiro's selfless attitude or his own inner conflicts with his way of doing things. 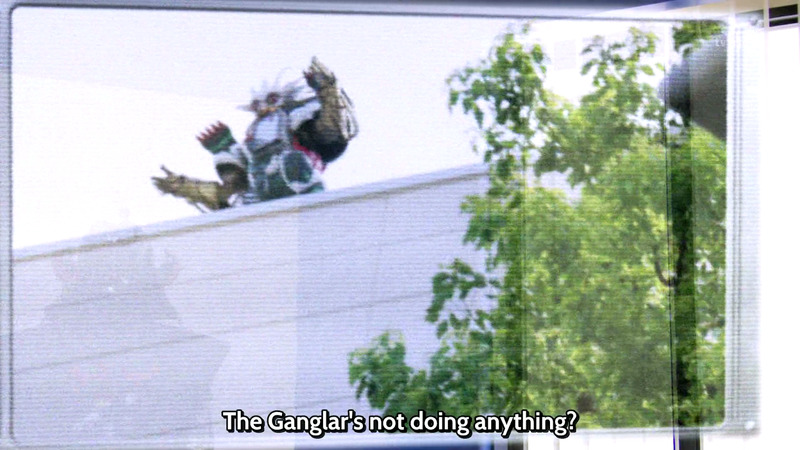 Back at the Patrangers HQ, they seem to have already known about Kunks and have been monitoring him. Obviously, this trip Keiichiro took was related to that. They are still trying to hid this mission from Noël Takao. I really hope they call him out soon. Things are taking a serious turn for the two reds. While walking, Keiichiro senses something is bothering Kairi and presses him to share and, oddly, he actually does. Turns out, this whole event reminded Kairi of a very similar experience he had with his older brother. While the two were on a trip, Kairi's big brother stopped everything to help a little lost girl and he couldn't understand why. A relatable back story doesn't need to be the exact same thing. Could it be that Keiichiro has been getting under Kairi's skin because he reminds Kairi of his older brother? 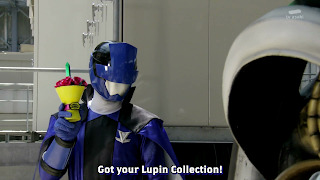 Elsewhere, Kunks is finally ready to make his move when Sakuya and Tsukasa appear to fight him. Grab a clothespin, we have a stink monster. While this is happening, Keiichiro's true agenda is revealed and it actually isn't about Kunks. 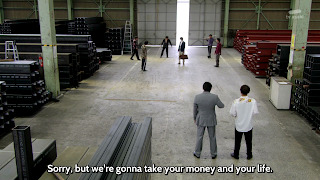 He is playing the undercover cop role and is attempting to purchase a new VS vehicle from some criminals in a warehouse. Well, didn't see that coming. However, in what almost feels like a nod to cop shows, Keiichiro's situation turns sour. 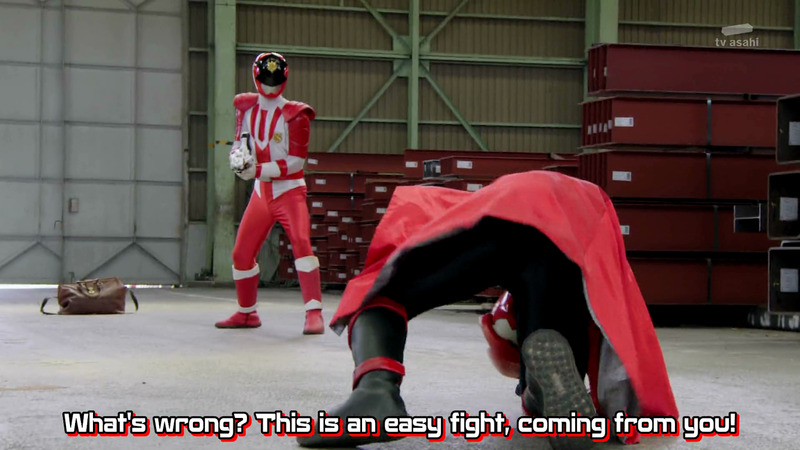 Oddly, by Super Hero standards, it is actually super rare to see a ranger fighting a regular human criminal. The thugs are no match for Keiichiro's martial arts and are defeated easily allowing him to claim the VS Vehicle and arrest them. Kairi, who was secretly watching everything, appears in his Phantom Thief outfit to steal the fire engine and the two reds get in a fight over it. 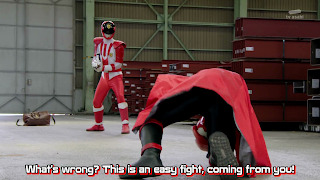 Previously, it has already been established that Kairi is the superior fighter to Keiichiro, however, he is only trying to retreat instead of fight back which is causing him to take some damage from PatRan Ichigo. 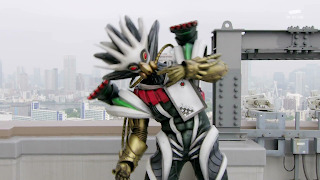 Maybe Kairi doesn't care to hurt Keiichiro anymore or maybe he secretly wants to lose but cannot justify ignoring the collection piece to the others. Cutting back to Kunks' fight, Tooma, Umika and Noël Takao as a Phantom Thief all appear and join in the battle and immediately grab the collection piece. This season has been known for these rushed endings to sub stories. "Rosy Life". A rose milkshake with a Crystal straw? I swear, the collection props are the highlight of this season. Finally, the Gangler does something; as in he releases a big cloud with a nasty smell. I wish Kunks was the main plot now. It is revealed that the collection piece was actually keeping his smell down. Kunks has all the rangers powerless, but gets made giant without being defeated because the main villains can't take the smell and want the plan over with faster. Okay, that was funny. The plan is in motion, while Kunks had his smell hidden he was secretly spreading gas around the city and is now causing a series of flame explosions from igniting the gas. That is actually pretty cleaver. 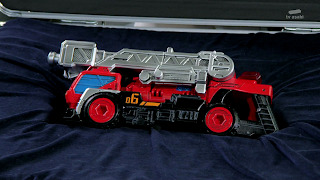 The only hope for the city is Splash, the Fire Engine VS vehicle that the two reds have been fighting over. 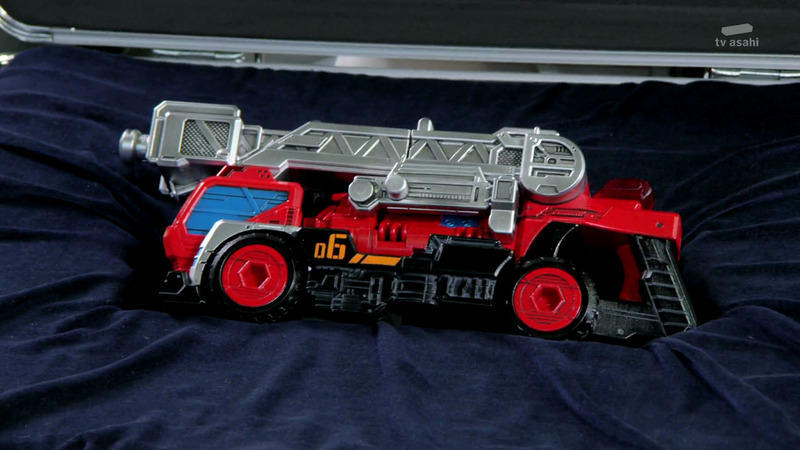 Realizing the danger the city is in, Keiichiro makes a tough decision, he swallows his pride and pleads for Kairi to go and help since LupinRed's Jet is faster than Patran Ichigo's patrol car. Kairi reluctantly agrees and races back to the city. A win and a lose for Kairi. 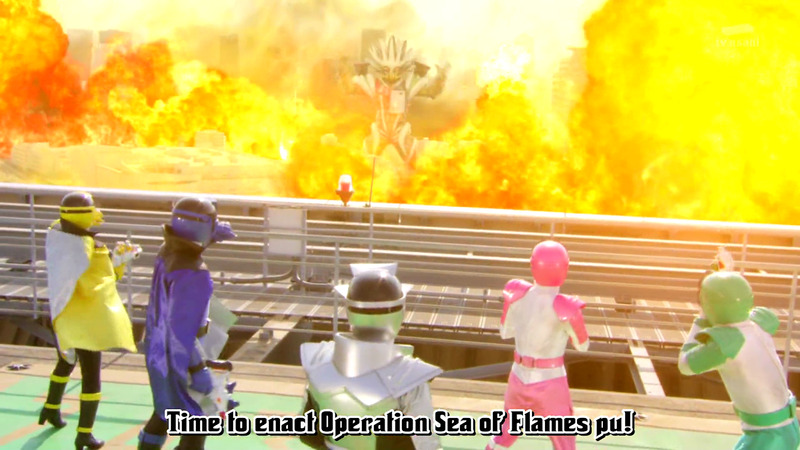 Little is spoken between the rangers when Kairi returns. 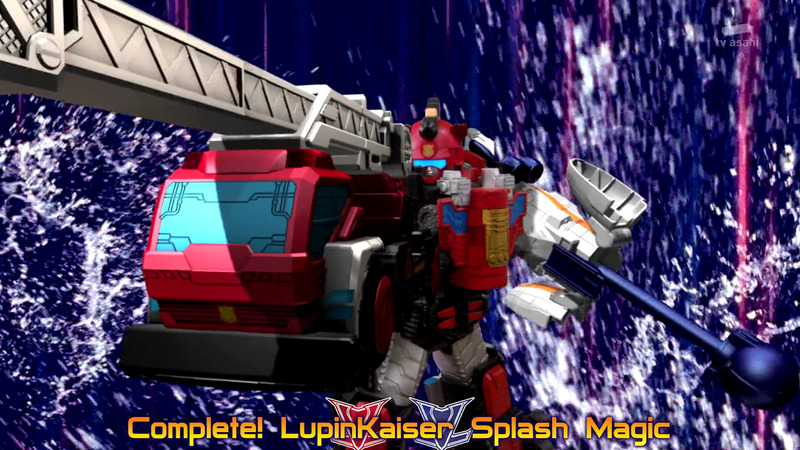 He hesitates a little, but ultimately, a combination is formed combining LupinKaiser, Splash, and their Magic blimp. It is all a straight shot from here. 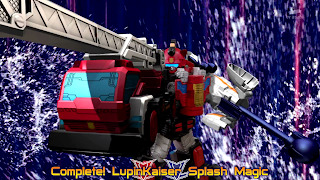 The Lupinrangers put out the burning city (which shows no signs of fire damage) and almost instantly defeat Kunks by making him explode in a magic water bubble. They bid it an Eternal Adieu. 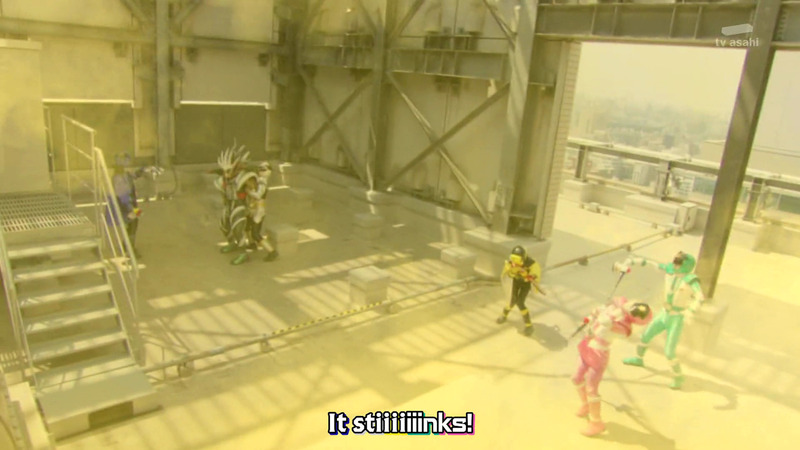 Whenever the episode is near it's end, the monster just stands still in shock and gets defeated. I am so sick of that. The episode ends on two fronts. 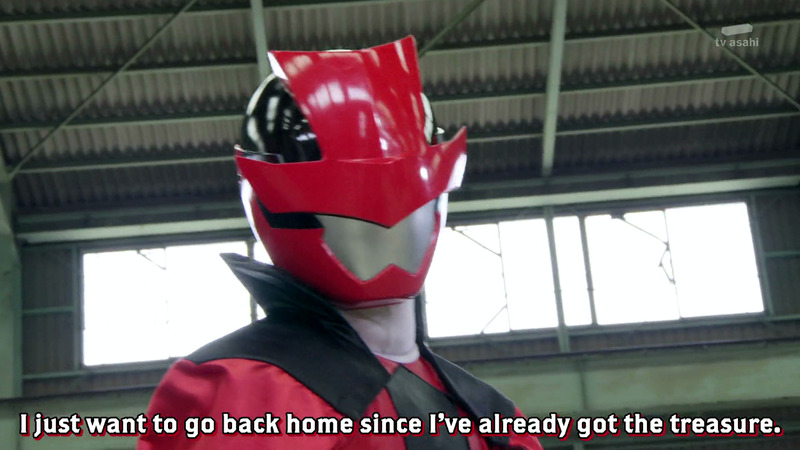 Keiichiro apologizes for giving away the VS vehicle but is reassured that he made the right decision for the greater good. Kairi is praised for his win but is dealing with some inner struggles because Keiichiro acts a lot like his lost older brother. I knew it.